One snowy night a famous Hollywood actor slumps over and dies onstage during a production of King Lear. Hours later, the world as we know it begins to dissolve. Moving back and forth in time-from the actor's early days as a film star to fifteen years in the future, when a theatre troupe known as the Travelling Symphony roams the wasteland of what remains-this suspenseful, elegiac, spellbinding novel charts the strange twists of fate that connect five people: the actor, the man who tried to save him, the actor's first wife, his oldest friend, and a young actress with the Traveling Symphony, caught in the crosshairs of a dangerous self-proclaimed prophet. Sometimes terrifying, sometimes tender, Station Eleven tells a story about the relationships that sustain us, the ephemeral nature of fame and the beauty of the world as we know it. Station Eleven just shows how science-fiction — and “genre fiction”(I hate that label) — is looked down on in the literary community. 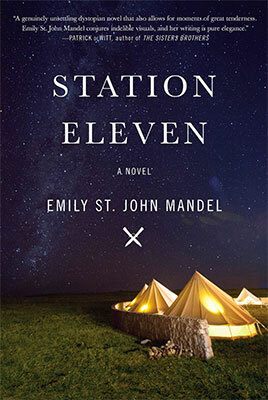 Station Eleven features a pandemic, the fall of civilization and life in the future; however, even Emily St. John Mandel rejected the sci-fi label in a tweet: “I actually don’t think of Station Eleven as sci-fi”. Apparently, the book had to be a literary fiction and only a literary fiction, as if genres were hermetic boxes. I got the feeling that the science-fiction label kind of devaluated the novel in the author’s eyes. Why would you use so many tropes of the genre, then? Station Eleven is a finely written novel with a contemplative quality to it. It features a relatively classic plot in which a pandemic wipes most of humankind from Earth. The story focuses especially on one character, an actor called Arthur Sander, and how he influenced the life of completely unrelated people, in big and small ways, even after his death. The story spans from decades preceding the pandemic, when Arthur is trying to break through as a Hollywood actor, to roughly twenty years after the disaster. The narration is shared by multiple characters, some more interesting than others: I really enjoyed the timeline of Kristen, a survivor of the plague, who is seeking meaning in life in the post-apocalypse North-America. I also loved Miranda, a courageous woman who spent her life writing comic books reflecting her life and feelings in secret. However, I couldn’t make myself interested in Arthur, his best friend Clark or in the paparazzo Jeevan: fame, weddings, affaires, divorces… It felt like tabloid gossips and, to be honest, bored me. Adulthood’s full of ghosts. (…) I’m talking about these people who’ve ended up in one life instead of another and they are just so disappointed. Do you know what I mean? They’ve done what’s expected of them. They want to do something different but it’s impossible now, there’s a mortgage, kids, whatever, they’re trapped. The main attraction of Station Eleven is how all those lives are linked in some way to one single person, Arthur. Unfortunately, I found those links very weak. Arthur Sander managed to pass on some memories and objects to posterity, but it didn’t seem to have such a significant impact overall. I didn’t feel that the other characters’ life would have been so different, had Arthur not influenced it. What’s more, there was no surprising consequence from their relation to Arthur and this was probably one of the most disappointing aspect. I was expecting some big revelation, huge coincidence, unexpected impact, something at the end… but it didn’t come. However, I enjoyed how the book puts the accent on arts — all kind of arts — from acting to literature, from classical music to comic books. The book shows the multiple missions of art: lift people up as well as take snapshots of our culture at a certain point in time. It also shows how art and beauty is a goal in itself. In my favourite scene, a character who realizes she’s infected goes and sits in front of a peaceful landscape to enjoy its beauty till her last breath. Station Eleven also has some nice comments on modern society and human behaviour. Another part of the book I really liked was in an airport where people get stranded as the pandemic peaks. This floating, in-between moment in which people are uncertain about what’s happening, how to behave, and whether to maintain or break the usual rules, was really well captured. She was thinking about the way she’d always taken for granted that the world had certain people in it, either central to her days or unseen and infrequently thought of. How without any one of these people the world is a subtly but unmistakably altered place, the dial turned just one or two degrees. Station Eleven has been abundantly praised for being a literary science-fiction novel but while the book has an undeniable quality and certainly helps bring literary readers to what-is-called “genre fiction”, it doesn’t bring much novelty. There are plenty of beautifully written, insightful science-fiction out there: for instance, you can try Blindness by Nobel Prize José Saramago, which is also a literary apocalyptic fiction and is far more original and insightful than Station Eleven. As much as I loved Station Eleven, I do agree with your point about the connections in the story being quite weak. I didn’t find Arthur a very interesting character, yet he was the main connection point for everyone else. I also loved Blindness and agree it was a very original story. Wasn’t there a sequel? Wow, I hadn’t realized the author rejected the sci-fi label… I rated this the same as you for the same reasons. Everything in this book people were gushing over turned out to be very run-of-the-mill post apocalyptic sci-fi stuff. I wasn’t very impressed with the plot, although the writing was beautiful at points. I’ll have to pick up ‘Blindness’ sometime soon. Well, the risk is that you might not find it very original since you read a lot of post-apoc books before and well… the author uses a lot of common tropes. The literary aspect lies on the quality of the writing. It’s at times beautiful. To me, unfortunately, it was not enough to counterweight the weak plot.